In sharp contrast with the southern and southeastern uplands of Ohio, rockshelters are rare in the northern parts of the state. Only at Krill Cave has it been possible to reconstruct a temporal sequence from the Archaic through Late Woodland times on the basis of quantitatively appreciable data. The results of these excavations (carried out in the summers of 1974 and 1975) can best be discussed in terms of what the three major occupations have in common. The share commonalities are probably due to the environmental/ecological setting in which the occupations occurred. 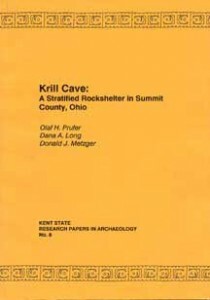 The latest number in the series of Kent State Research Papers in Archaeology provides a complete site report of the Krill Cave Rockshelter.